The Action Plan aims to stimulate Europe's transition towards a circular economy to boost global competitiveness, foster sustainable economic growth and generate new jobs. It gives a clear signal to economic operators that the EU is using all the tools available to transform its economy, opening the way to new business opportunities and boosting competitiveness. The broad measures for changing the full product lifecycle go beyond a narrow focus on the end-of-life stage. Innovative and more efficient ways of producing and consuming should increasingly emerge as a result of the incentives we are putting in place. The circular economy has the potential to create many jobs in Europe and globally, while preserving precious and increasingly scarce resources, reducing environmental impacts of resource use and injecting new value into waste products. The proposed actions will contribute to "closing the loop" of product lifecycles through sustainable consumption and production and sound waste management, including greater recycling and re-use, also by creating a market for secondary raw materials. This will bring benefits for the environment, the economy and the society. Together with the Action Plan, the Circular Economy package includes Revised Legislative Proposals on Waste that include targets for recycling, measures for reducing landfill, to promote re-use and stimulate industrial symbiosis, as well as economic incentives for producers to put greener products on the market. In January 2017 the European Commission reported on the delivery and progress of key initiatives of its 2015 Action Plan in the Report on the implementation of the Circular Economy Action Plan and annex. The EU is committed to financing the transition towards a circular economy. Over EUR 650 million were allocated to the ‘Industry 2020 in the circular economy’ priority under the Horizon 2020 Work Programme for 2016-2017. In the 2018-2020 Horizon 2020 work programme, circular economy is also a priority, under the Focus area "Connecting economic and environmental gains - the Circular Economy". The European Commission has also extended the European Fund for Strategic Investments (EFSI) into its second phase until 2020, with a view to mobilising EUR 500 billion of investments, including in the circular economy. As far as Cohesion policy is concerned, for the period 2014-2020, about EUR 150 billion are allocated to objectives with a direct relevance to the circular economy. This includes about EUR 41 billion made available to the implementation of the so-called smart specialisation strategies of EU regions and Member States. The LIFE programme has been supporting projects relevant to the circular economy and resource efficiency since 1992 with over 670 waste reduction, recycling, and reuse projects, totalling over EUR 1 billion of EU funding. During the first two years of the new LIFE programme 2014-2020, over EUR 100 million have been invested into about 80 circular economy projects. The transition to a circular economy is also supported financially by national level investments. High-level and long-term commitments have been key to the promotion of a circular economy in the This commitment has led to the endorsement of the EU Action Plan on circular economy, with benefits in mainstreaming and in working across different policy areas to support its implementation. It is also mirrored in an increasing number of financing opportunities for concrete projects. Engaging a wide range of actors from both the public and private sectors is crucial for a successful transition to circular economy. Mobilising these actors and establishing strong partnerships may require substantial efforts, as the process entails the development of circular economy strategies at various sectors and levels of action. The Circular Economy Missions are a series of high-level political and business meetings in third countries to communicate and promote sustainable and resource-efficient policies. They bring together European institutions, NGOs, companies and relevant stakeholders in partner countries that have expressed an interest in reaping the Circular Economy opportunities. To support green European businesses (especially SMEs) to expand their activities abroad and promote green solutions through business partnerships. Discussions during the circular economy missions focus on topics related to eco-innovation, chemicals and plastic, waste, water management, marine pollution and urban environmental best practices. the ‘Clean Energy Cooperation with India’. 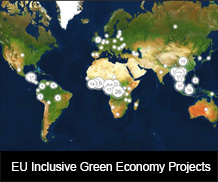 Circular economy projects are funded under several EU programmes, e.g. Horizon 2020, the SME Instrument, and the LIFE programme. a monitoring framework on circular economy.